Server Packages: NOTE: All server admins must perform this step first! ServerPackages=ChaosUTMaking sure there are no empty spaces at the end of each line.This will enable clients on your server to see the Chaos ‘stuff’. 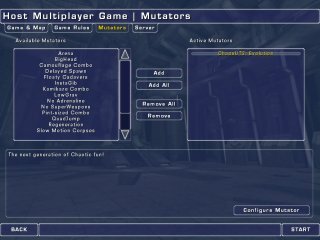 You can easily start a server running ChaosUT2 just as you would any other standard game of UT2003, simply by adding the ChaosUT2: Evolution mutator in the mutator selection menu.Clicking on the ‘Configure Mutator’ button will allow you to configure your various Chaos settings. Flag Drop on Grapple – If you do not want players to be able to carry the flag while using the grappling hook, then check this option. The flag will be dropped automatically when the grapple is fired. Start with GravBelt – Players will be given a GravBelt when they enter the game, and each time they respawn. These belts will automatically recharge when they are not in use. 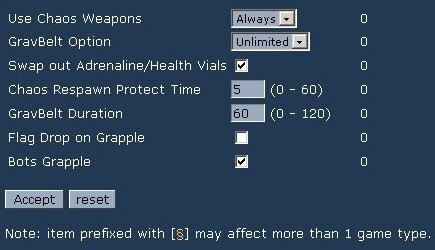 Respawn Protection Time – Set the duration of respawn protection. 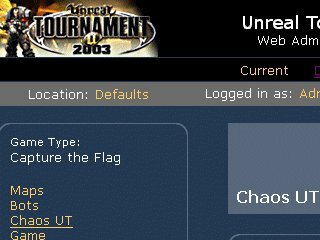 The Chaos settings are available to those who use the Remote Web Admin feature that comes with UT2003. Under “defaults”, simply click on “Chaos UT” on the left hand menu. 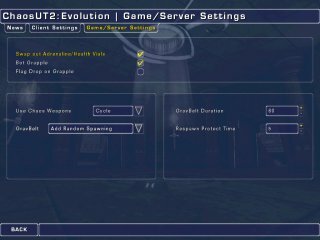 The menu that appears is essentially the same as in the Chaos configs. Use Chaos Weapons – Choose to have Chaos weapons cycled with standard, replace standard, or left out. GravBelt Option – Choose your preferred method of using the Anti-Gravity Belts. Chaos Respawn Protect Time – Set the duration of respawn protection.